This analysis was written by Judith Sunderland and Bill Frelick of Human Rights Watch and was published in Open Democracy on April 15, 2015. The European Commission is working on its ‘comprehensive migration agenda’ while migrants continue to die at sea. Its tenants should be self-evident, yet some proposals for it are troubling. The European Union’s misplaced response to increased flows of migrants and asylum seekers, including the failure to rescue boats in distress and pushbacks at land borders, is risking lives. At a time of severe humanitarian crises around the world, there are alarming signs that the EU is doubling down on externalising its border management and asylum responsibilities. Over 220,000 migrants and asylum seekers reached the EU by sea in 2014, four times as many as in 2013. 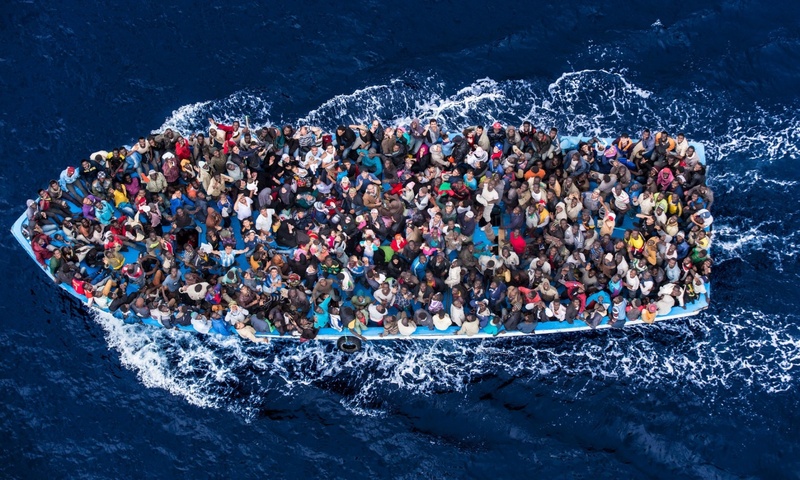 The Mediterranean is the world’s deadliest migration route. Over 3,200 died in 2014, and the death toll so far in 2015 is 470, compared with 15 in the same period last year. The problematic EU response largely focuses on border enforcement and preventing departure from North Africa and elsewhere, rather than on improving search and rescue and creating safe and legal channels into the EU. Italy ended its massive humanitarian naval operation Mare Nostrum in November 2014, with the EU border agency Frontex launching the much more limited Triton operation. Despite increased funding for Frontex, it lacks the resources or, most important, the appropriate mandate to ensure robust search and rescue operations throughout the Mediterranean. The number of irregular boat migrants recorded between November and March—i.e. between the end of Mare Nostrum and now—was almost double that of the same period a year earlier. The numbers show that rescue operations are not a magnet for migrants, as UK Immigration Minister James Brokenshire and UK Foreign Office minister Lady Anelay, among others, have argued. Instead, the increase has shown that people will continue to attempt the journey even in the absence of any certainty of rescue. Migrants and asylum seekers also try to reach the EU over land, encountering fences, pushbacks, and ill-treatment. Bulgaria and Greece have bolstered their guard forces and built fences along their borders with Turkey, causing many, including people fleeing Syria, to attempt the more dangerous route across the Aegean Sea. Spain has fortified the borders of its enclaves in North Africa—Ceuta and Melilla—with a law formalising the unlawful practice of summarily returning people caught on the fences, even though they are already in Spanish territory. Many are injured, including through excessive use of force by Spanish border guards, and face ill-treatment by Moroccan security forces when sent back. Along the Balkan route—the third main irregular route into the EU—migrants and asylum seekers also experience police abuse, denial of access to asylum procedures in Serbia and Macedonia, and pushbacks from Macedonia to Greece. Migration and asylum issues are high on the EU agenda, and feature prominently in public debate across the region. The European Commission is to present a “comprehensive migration agenda” in May. Some of the ideas floating around are deeply troubling. There is real cause for concern that the EU will implement abusive policies cloaked in humanitarian garb. Italy’s recent “Non Paper on Possible Involvement of Third Countries in Maritime Surveillance and Search and Rescue” is a case in point. The brief document, submitted to EU interior ministers in mid-March, proposes EU technical and financial assistance to countries like Tunisia and Egypt so they can “prevent the departure of migrants from the southern shores of the Mediterranean” in order “to save the greatest possible number of lives.” The catch is that those prevented from departing or interdicted in territorial waters of North African states would be taken ”to their own ports” far from the EU and its well-developed asylum system. This plan would certainly limit arrivals, but not necessarily provide a safety net for those seeking humane treatment and sanctuary. Italy is pushing another potentially problematic proposal: setting up refugee processing centres in third countries (candidates apparently include Egypt, Sudan, and Niger). Refugee resettlement programmes run under UN High Commissioner for Refugees (UNHCR) auspices have historically provided durable solutions to hundreds of thousands of refugees trapped in dead-end camps. But an EU-run offshore processing system similar to past and present offshore processing by the United States and Australia—which have and continue to keep interdicted asylum seekers and recognised refugees in protracted limbo in isolated, dismal holding centres—would be a serious cause for concern. Would reception conditions for asylum seekers be comparable to Europe’s? Could their safety be assured while their claims were being processed? How long would they have to wait? If the processing involved deporting people screened out to their countries of origin, would these centres operate more like immigration detention than a camp/shelter model? Would the existence of such centres make it more likely that boat migrants would be interdicted and returned there? Would irregularly arriving asylum seekers in the EU interior also be transferred there to have their claims processed? Both these proposals raise questions about the real motives of EU and Italian policymakers: do their actions stem from humanitarian concern, or from a cynical desire to limit the number of refugees, asylum seekers, and other migrants arriving on their shores. If EU member states were genuinely interested in sharing the burden with front-line states like Lebanon, Turkey, and Jordan, they would have responded generously to UNHCR’s appeal in December for 130,000 Syrian resettlement places. As of March 12, only Germany (30,000) and Sweden (2,700) have made credible pledges; the other 26 states combined have pledged 5,438. Another staple of EU rhetoric these days is the need to stop traffickers and smugglers, when the primary objective is really stopping their passengers. EU officials, including Migration Commissioner Dimitris Avramopoulos, conflate traffickers with smugglers in their self-serving argument that preventing departures and dismantling criminal networks is a “humanitarian mission” to save lives. But many migrants and asylum seekers turn to smugglers because they have no other options. There is legitimate reason to prosecute criminals, including those who prey upon migrants, but the focus on stopping the smugglers is consciously myopic, one-dimensional, and an inadequate response to the problem. Tackling root causes through development aid in countries of origin is a central plank of the EU’s response. Though laudable, this is unlikely to save lives today. It is also disingenuous because it seeks to portray those attempting to reach the EU as economic migrants, when over one-fifth of those who arrived by sea last year came from Eritrea—a repressive, closed country—while many came from Mali, Nigeria, and failed states where human rights are routinely abused. According to UNHCR, 37,000 Eritrean asylum seekers reached the EU in the first ten months of 2014—triple the number from the previous year. The EU is reportedly planning a multi-million euro development package to Eritrea in hopes of stemming the flow. The danger is that these kinds of programmes will justify preventing departures as well as forced returns, ignoring the human rights abuses driving people from their homes. The foundations of an EU migration policy should be self-evident: saving lives at sea, treating migrants decently, giving asylum seekers access to fair procedures and respecting the obligation under international law not to send people back to places where they face threats to their lives or freedoms. Properly managed, and with a fair distribution among EU member states, the numbers of migrants and asylum seekers should not be cause for alarm. Instead of shirking and diverting responsibilities, the EU should overhaul its current ‘Dublin’ approach to EU responsibility sharing, which puts an unfair burden on states on the EU’s external borders. It should furthermore establish a more efficient system for processing asylum claims of irregular arrivals, increase the paltry number of refugees it resettles, grant more humanitarian visas, and ease restrictions on family reunification. But the first imperative is to save lives. The EU’s failure to invest the necessary resources and effort for Mediterranean-wide search and rescue is inexcusable and should be rectified immediately. Bill Frelick is the director of the refugee programme at Human Rights Watch.